Preparing for a photo-vacation is both exciting and frustrating. I research locations, lookup moon and sun rise and set times, track the weather, figure out the best place to stand, view hundreds of photos ... the list goes on. By the time I’m ready for the trip I have a pre-visualization of the exact photo that I’d like to take. I also know that the perfect photo rarely happens. 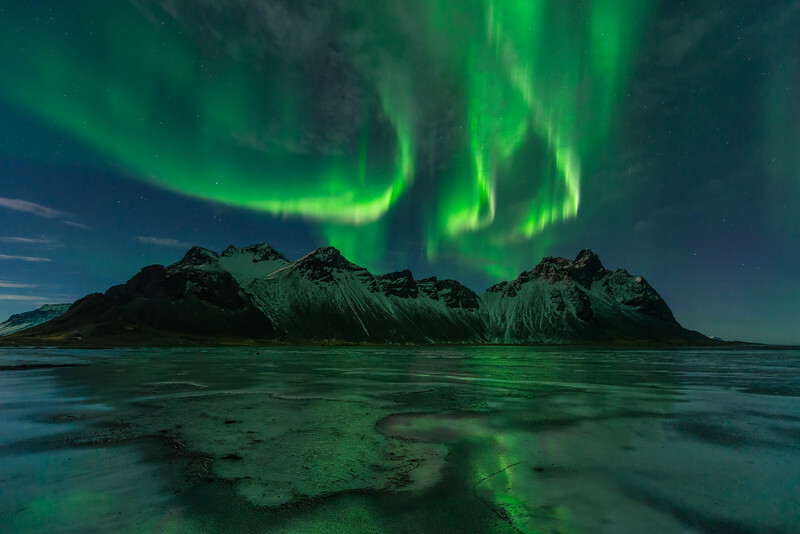 Still, I had my hopes up for an aurora-filled visit to Vesturhorn Mountain in Iceland. Willie, Alan, Rebecca and I had enjoyed an amazingly spectacular display of Northern Lights the night before, when the sun kicked up a Kp 5 solar storm for us. We watched in amazement as the aurora danced before our very eyes and took hundreds of photos of the amazing display. Selfishly we hoped it would repeat the following night when we made our way further east to Vesturhorn. The following night we drove to Vesturhorn, parked our Happy Camper RV’s on the side of the road and waited. Clouds had rolled in after sunset and we were a bit discouraged. We could see the Northern Lights hiding behind the clouds but those dang clouds were obscuring it! We went to bed hoping the clouds would clear. Every hour I would wake up, check the sky, reset the alarm and go back to bed. I repeated this 5 times and, finally, at 5am, with a few hours left before sunrise, I noticed the clouds were disappearing. I grabbed the camera and raced outside. Before our eyes the northern lights danced, twinkled and streaked across the sky. Rebecca and I were so engrossed with watching the aurora perfectly dance through the sky that we almost forgot to wake up Willie and Alan! The next 3 hours were spent taking photo after photo, mostly in complete silence, as we made sure to soak in the scene. The images coming out of my camera blew me away — they were better than I had even imagined: an amazing mountain, a beautiful display of Northern Lights, and the aurora reflected in the ice ... what more could I ask for? !